Switzerland has won the International Bank Note Society’s (IBNS) Bank Note of the Year Award 2017 for the second year in a row. The IBNS selected Switzerland’s Ninth Series 10-franc banknote from more than 170 banknotes that were released globally throughout 2017. The Swiss 50, also from the Ninth Banknote Series, won the award for 2016. Switzerland’s 10-franc banknote is printed by Orell Fussli Security Printing Ltd. on Landqart’s Durasafe® composite substrate, consisting of a core paper layer and two outer polymer layers to increase the note’s durability when in circulation. It is the fourth consecutive hybrid/ polymer banknote to win the Bank Note of the Year Award. The design of each of the denominations of the Ninth Banknote series focuses on a typically Swiss characteristic, illustrated using a key motif. 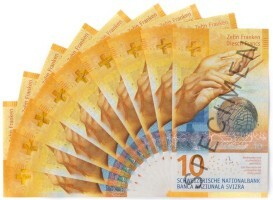 The motif of the 10-franc banknote is ‘Time’, focussing on Switzerland’s organisation prowess. SPARK® optically variable ink by SICPA, used to illustrate the globe on the front of the note. When the banknote is tilted, a golden arc moves across the globe. KINEGRAM® VOLUME foil stripe from KURZ, displayed on the front of the banknote revealing moving red and green numbers. Thrusafe™ window, revealing the Swiss cross when the note is held to a light source. Viewsafe™ window, revealing a section of the embedded security thread on the bank of the note. MICROPERF®, consisting of finely perforated holes which, when the note is held to the light, reveal an image of the Swiss cross. Tactile lines for the visually impaired, consisting of a block of short, raised lines located at the short edge of the note. Other features include a watermark, latent image, see through register pattern, microtext and images visible with ultraviolet and infrared lights. The Swiss 10-franc note began circulating in October 2017, replacing its predecessor that was introduced twenty years earlier.